ePublishing Knowledge BaseePublishing Knowledge BaseePublishing Knowledge Base Creating Image Galleries, Videos, Podcasts, and Downloadable FilesHow do I quickly select an image in the media manager without opening the file? There are multiple ways to select an image and insert it into your articles, blog posts or other content using the ePublishing Media Manager. The quickest is to simply select the image in the Media Manager directories without going into the file for the image itself. This article shows you how. 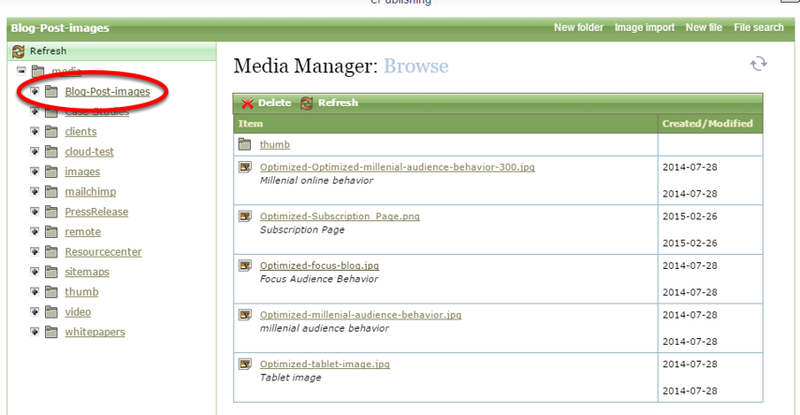 This approach works whether you are accessing the Media Manager from your Article or Blog Post Manager or another tool. 1. If you are using a WYSIWYG, click the image icon to access the Media Manager. 1.1. Another way to access the Media Manager is to click Browse in Image field. 2. After entering the Media Manager from your article, blog post or other content, select the directory in which your image lives. Zoom: After entering the Media Manager from your article, blog post or other content, select the directory in which your image lives. In this case, we have selected Blog-Post-images. 3. Click the icon next to the image that you want. 5. 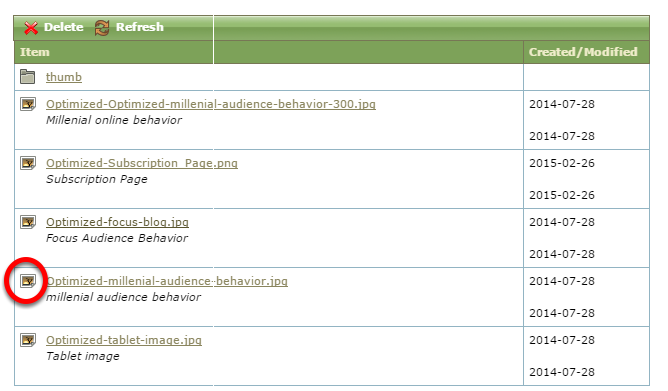 After you click Select, you will be taken back to your article, blog post or other content to make further edits. Prev: How do I upload a new video? Next: Is there a file size limit for files uploaded to the Media Manager?